Oh dear. 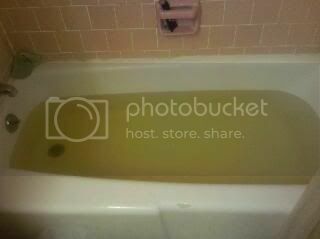 I think we might have a problem with the water in our apartment building. I am very sad because I was going to take a long hot bath to relax into sleep but somehow that is distinctly less inviting when your bathtub looks like Paul Bunyan's toilet. The maintenance folk 'round our place are like seventeen million and three kinds of annoying. This weekend is going to be a hoot! Eeewww! Forgoing the bath is probably a wise choice indeed. Hope they get it fixed very soon. And that there is a good sale on bottled somewhere close to you in the meantime. Ew, but your description was hilarious.